I love flamenco. Okay. I said it. When I lived in Spain for a short while, I took classes. I hear the Gypsy Kings and immediately my body starts twitching and moving on its own. And I want my kids to feel the same way. 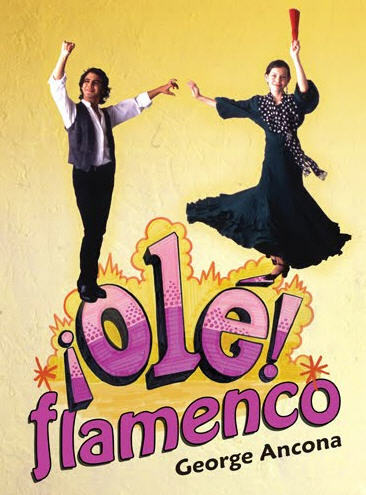 So here are some of the resources I have found on flamenco. And one of the best is George Ancona’s book, ¡Olé! Flamenco. It is a great basis for any lessons on this subject. I’ll be sure to add more to this page as I discover new resources. And if you find some, por favor, share it with us! • Flamenco and its Origins – this lesson is suitable for all grades, though I find that it is probably best suited for middle schoolers. • Spain's Very Delightful Flamenco Dance – A great little article! • Flamenco Fans – this craft is a little too commercial, but you can make it your own by painting flowers, scenes, etc. on the fan instead. And if you are looking for more decorative ones that are still relatively cheap, you can find many here on Amazon. • Make Homemade Castanets – simple yet perfectly effective! But you can also buy individual and kits of 25 at Teacher's Discovery. I really like these for their authentic appearance and the fact that you can decorate them makes them even better. • Box Guitar – Best geared for children in K-2nd. • Cardboard Guitar - I love this craft from Make It and Love It! So much fun!! • Flamenco Girl coloring page. Also, take a look at this one, and this page, too. • Jointed Flamenco Dancer - Teachers might enjoy this Spanish flamenco dancer with movable parts. • For little counters, Sesame Street has a short and lovely video for counting to nine with flamenco dancers. • Flamenco: Alegrías – A great look at flamenco dance. • Flamenco Guitar Barcelona – excellent guitar playing. Good for discussing culture and music. • John Catalano : Rumba Flamenco in the States Two Talented Young Guitarist – Wow! Inspiring! • ¡Olé! Flamenco by George Ancona. Read a review here. • Flamenco para niños - (DVD) An introduction to the world of flamenco aimed at a young audience, for kids to get to know and enjoy flamenco song, dance and music. English. Are you or your kids in the mood to learn how to dance flamenco, now? Well, check out this fabuloso directory of flamenco classes in North America! My dream is to live in Spain some day. I spent a Summer there and fell in love with it. How long were you there? It is a beatuiful country and I miss it so!